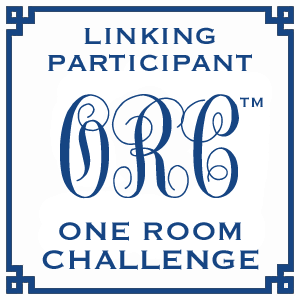 I am in the process of redecorating our guest bedroom and bath and linking up with 71 other bloggers courtesy of Calling It Home!! If you missed the previous weeks ... you can catch up here. Week 5 for me is my DIY reveals!! First, let me say that DIY means a lot of things to different people. Some design bloggers I read DIY it all ... shop for the wood, cut the wood, make the bench, paint the bench, sew the cushions ... every single step of it. And I read each step and think ... DANG ... there are talented. 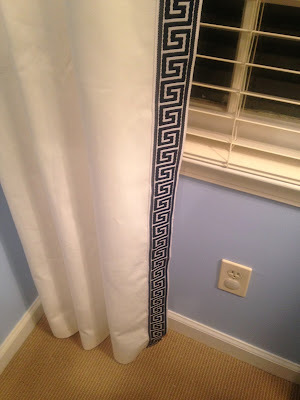 I knew I wanted the trim to sit inside the edge of the shower curtain so I used the trim to mark the space with straight pins and then started attaching the trim to the curtain just inside the straight pins. And this is the best part ... with my hot glue gun. Yes!! I attached the trim with hot glue. I do it for all the trim in the house. And I don't even use an expensive glue gun ... just high temp glue and a regular old simple glue gun. And it works better than sewing it!! Pinky swear! For me this works so much better ... I can work as slow as I need to ... trim it up when necessary and get it nice and straight! And reveal ... Here he is ... all fancied up with his new (glued on) trim!! 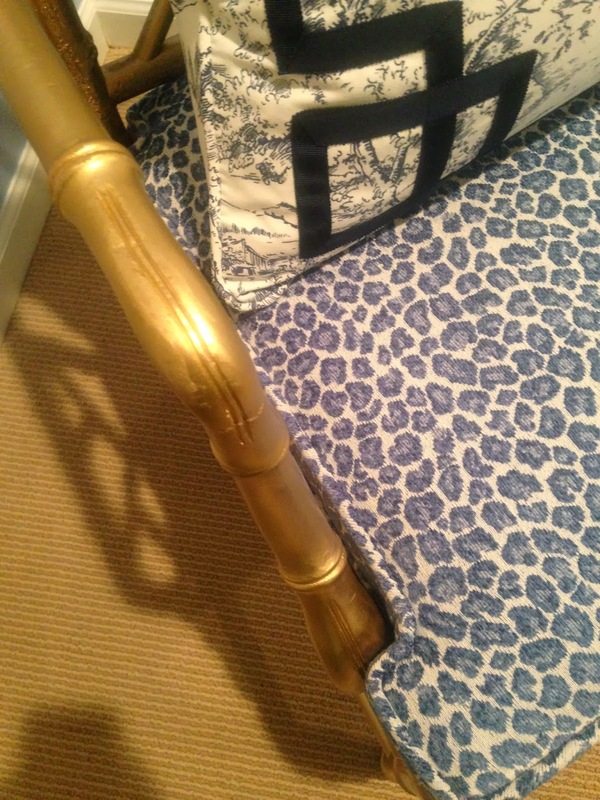 The original plan for the panels was to use the dust ruffle from the Ralph Lauren bedding set and add some navy grosgrain as trim. I loved this idea and am still a smidge sad it did not work out as planned! 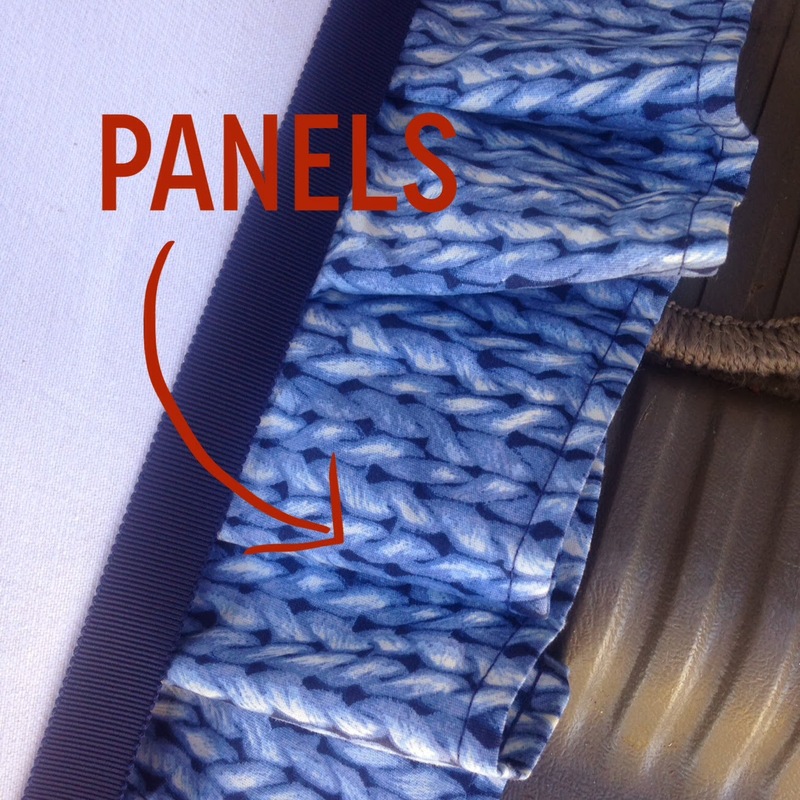 When I measured the panels and the amount of fabric I had from the discarded dust ruffle I came up way short. Like 2 panels short. I contemplated only hanging two panels and I just couldn't make myself do it. It seemed unfinished to me and so that adorable panel plan had to go! As I mentioned earlier ... the panels are from Ikea. I purchased the Merete panels at the amazing cost of $27.99 a pair. They are thick, hang beautifully and come ready to hem with a raw edge. In my opinion, they are the best you can buy for a hack project!! And I hacked them!! I had just the perfect amount of Greek key trim left to add to my panels. And by perfect I mean ... 5 yards to the line! So ... 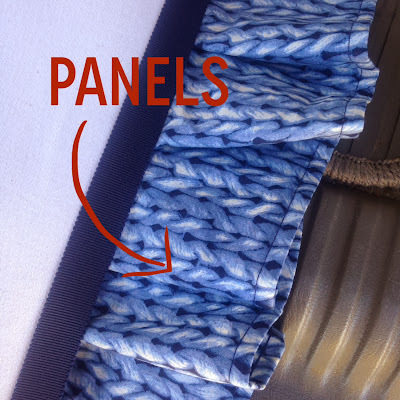 I laid out my new hemmed panels on the floor ... and I added my trim, once again with my trusty glue gun! And I love them!! I am thankful I stuck to using all 4 panels. I really feel like the bed needed to be framed out and the crisp navy against the bleached white panel is pure heaven!! Yep. Panels for a song!! I love this chair!! When I purchased it from the sweet Details Atlanta just for the project, Dara and I talked about it needing some paint love. At first I thought I would use red but I settled on gold. Of course, I chose gold ... every single thing that isn't nailed down in this house is getting a coat of gold paint. And I am so happy I did!! I took the chair to my upholsterer and asked him to remove the seat and back before I painted it. 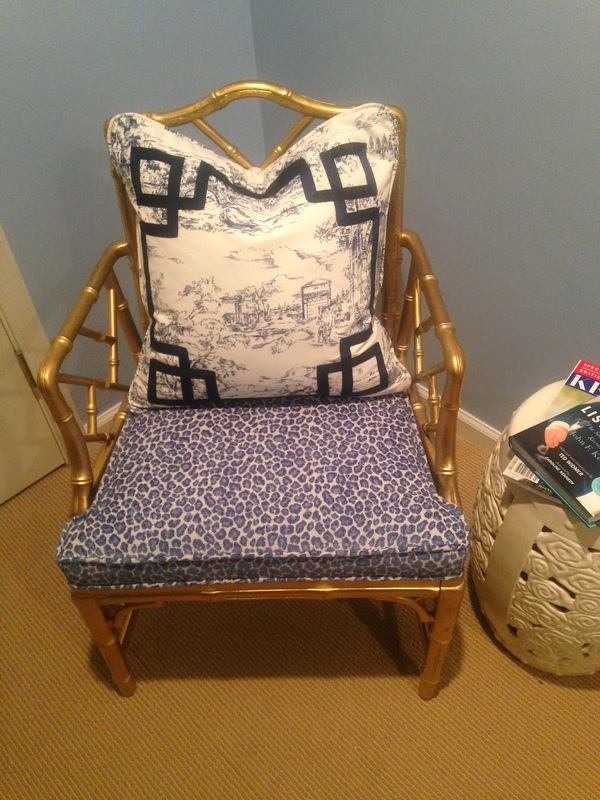 He kept the patterns so he would know what size to make them both when I returned the chair in its newly painted gold glory!! 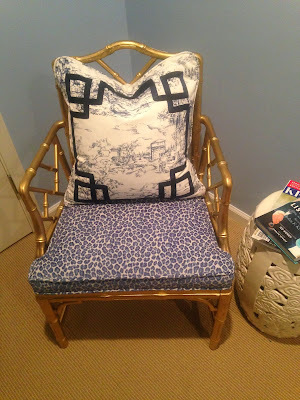 And then I pulled out my stash of gold spray paint and transformed it from great chair to AMAZING!!! If my neighbors heard me outside that day they would have thought I was completely crazy. I was gushing like crazy over this transformation. I must have called all the besties and sent pics at least three times! And I painted while I was on crutches ... but that is a whole 'nother story entirely! I die. I love this chair ... love, love, love it! Wish it was in my bedroom so I could see it every day, love it! I think its perfect for the space, I love the gold and bamboo details and the leopard is perfect to me!! Precious ... couldn't be happier with my little chair!! Welcome home little friend! I will be busy pulling it all together, but I am thrilled to show you my finished rooms!! See you next week for the REVEAL!! Love the shower curtains and the trim! I have been known to use stitch witchery on trim:) Shhhhhh. I am so feeling the love with both the curtains and chair. I'm working on some draperies this week and I've been debating sewing vs gluing the trim...I think I'm going to go with gluing after your glowing review. Do you do a strip down the middle or zig-zag the glue?? What's the best way to work it girl? BTW I love all the greek key trim! This is all looking fantastic! 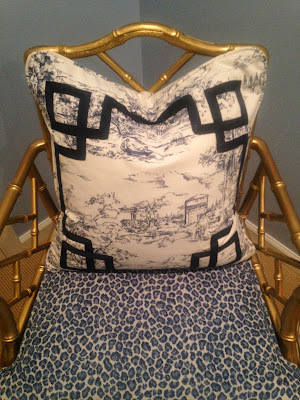 great job, and I love everything greek key and that chair makeover! wonderful job. The curtains look immaculate and the chair is gorgeous in gold and the contrast of the fabric. Love, love, love. It always works out for the best...most of the time :). Great. You should be proud, the curtains and chair look so fabulous!!!!! Can't wait to see the reveal next week! Good tip on the glue gun and trim. So much easier than sewing! I also really love that chair. Can't wait to see everything next week. So good! Love it. Thanks for the tip about the trim. Was dreading sewing the trim on. OK, you are totally my kind of DIY girl!!! 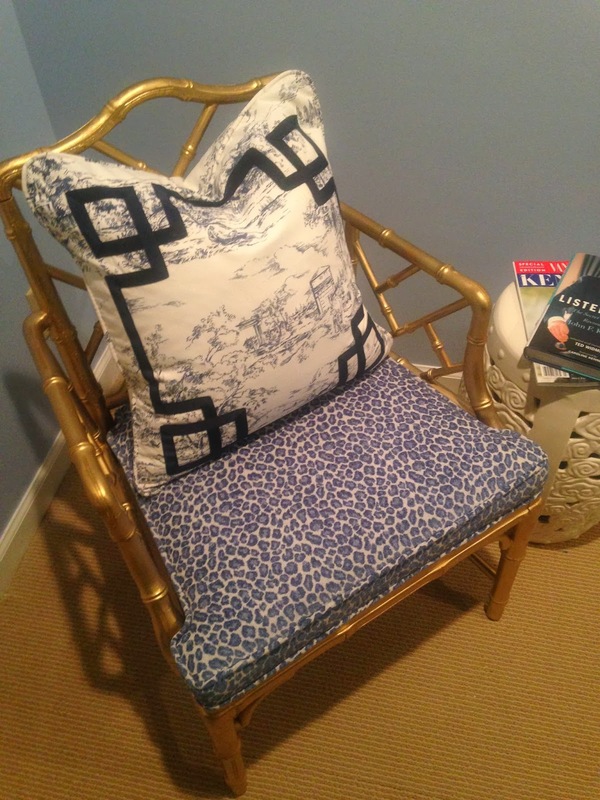 Love your little projects but am over the moon about that chair, leopard and gold? Be still my heart!!! The chair is amazing!! I've watched your teasers on IG, can't wait to see the finale! Once again Miss Paige, you have outdone yourself! Love it all! Can you ever have too much greek key trim?! I don't think so! Give me that chair!!! Love a glue gun!! Your drapes and your shower curtain look fabulous. Love that gold chair. Looking forward to seeing the whole place next week. I die too! If you turn away long enough, I will swoop in and grab that fantastic chair. Love the gold chair! I want one!! Glue guns are my best friends! Love them. The trim and chair are awesome. Wow! That chair is beautiful - spray paint is our friend! I'm working on curtains this week also, I'm just afraid the glue will show through - so, I plan on using stitch witch (I'm such a fraidy cat) Love the way your curtains turned out - wish me luck on mine! Looking forward to the reveal! I'm so impressed with your room, and your DIY projects!! I am so terrible at DIY... A can of spray paint is about as far as I can go with DIY, and even then I kinda stink! Cannot wait for the final reveal!! okay I love the trim -- I use fabric glue -- have you ever done that? I am doing the same to a clients house and hung the curtains and leave them up and then just glue them easy peasy. and that chair... I die too! I LOVE LOVE LOVE your chair too!!!! Looks AMAZING! I really love your taste! Can't wait to see next week! Love the trim and that gold chair! I've always thought glue would be much easier than that iron on tape if you didn't want to sew. You are right, that chair is fabulous! I love your fabric choices! So many gorgeous gorgeous details and it still looks so clean and crisp. I die over that gold chair too!! ok seriously, you've just broadened my world of "non sewing" potentials!!! haha, I am no seamstress so I have always used stitch witchery for EVERYTHING. I never would have thought to hot glue those suckers! love it and it looks beautiful! good luck on the final stretch. I'm working away on mine as well. stop by if you get a second to breath (haha). Dying over your bamboo chair--seriously great DIY...if only I could nab some on craigslist! Love how those curtains turned out too! You nailed it!!!! Soooo good. My faves (plural)....the dresser turned out just like your inspiration pic, both lights, the prints in the hallway. Oh heck....I love it all....!!!!! That's Fabulous Blog I'm glad that I drop by your page and found this very interesting. Impressive blogs i have seen, Thanks so much for this post. I really liked the gold chair! I really want one!! Awesome designs thanks for sharing this!! If you are looking for staging your home for sale Atlanta then knock the door of Sisters Staging. Here I found some important and precious points about setting a home & learn few good tips from here.